I think you’ll agree that being able to keep the money you make from blogging is great. Most people know they need a blog disclosure, but don’t know what it should say or where it should be. In today’s post, I’m going to show you why disclosure statements are important, as well as what they should include and where they should be displayed. What Makes Such Disclosures Required? To make sure you get to keep the money you earn you’ll want to make sure you are in compliance with everything. Which means you will need to include the proper policies and disclosures on your website. At its core, the legal requirements aim to ensure you are being honest and transparent with your audience. You have to let your readers know what information you are collecting from them and why. As well as if you have any vested interest when it comes to links. It’s not only required but it helps to build trust with your audience. Since you are being, upfront, honest, and transparent, your audience can trust what you have to say. There are a few different laws that require you to disclose your relationship and the information you collect. The Federal Trade Commission has endorsement guidelines that break down in detail what constitutes a proper disclosure, as well as where such disclosures should take place. This includes disclosing any affiliate link included on a blog post or you were paid to do a sponsored post, or received free products to review. Additionally, the General Data Protection Regulation, more commonly known as GDPR requires companies and websites like yours to get consent to collect information and to let people know all of the information you are collecting. While there are those specific requirements, some other disclaimers you’ll need to include on your site will depend on the type of website you have. As well as what you are doing with the site. While I am an attorney, I am not your attorney and nothing on this website or downloads available are to be construed as creating an attorney-client relationship. Additionally, the information provided is for informational purposes only and nothing in this site or resources made available are to be considered legal advice. The author is not liable for any losses or damages related to actions or failure to act related to the content in this website. If you need specific legal advice, consult with an attorney who specializes in your subject matter and jurisdiction. Now that you know why disclosures are important, let’s dig into what should actually be included in your disclosures on your posts as well as your “legal” page. The FTC guidelines explain how you must disclose any vested interest you have for example, either as an affiliate or if you received products and services in exchange for a blog post. You must give notice to your audience, whether that link is used in a blog post, social media, or an email. If you are not following the rules (at least here in the US) you could be forced to give up the money you earned through the misleading links. Since the rules also apply to your affiliate partners and they could also be fined. They may even drop you as an affiliate if you are not complying. Additionally, some affiliate programs have specific requirements in the disclosures they want you to show. One well-known example would be Amazon affiliates. Amazon requires that you have very specific language in your disclosure on posts or pages where you include affiliate links. As well as on the page where you outline your legal policies. If you are a professional, say a lawyer, doctor, or financial advisor you want to make sure that your audience knows that your content is for informational purposes only and is not to be considered professional advice. One example of one would be what I shared earlier in this post. Different professions will have different requirements about what you can and cannot post but a disclaimer is always wise. Gone are the days of getting someone on your email list by offering a freebie. They must consent to receive emails from you and that consent cannot be conditional on getting the freebie. You can thank GDPR for that one. Either way, if you are collecting emails you need to share with the user what you are doing with that information and how long you keep the information. While commenting doesn't get someone on your email list, if your comment system requires the commenter to enter their name and email, GDPR requires you to share why you collect the information and how they can invoice their right to forget. You can learn more about these requirements by reading my GDPR Guide. 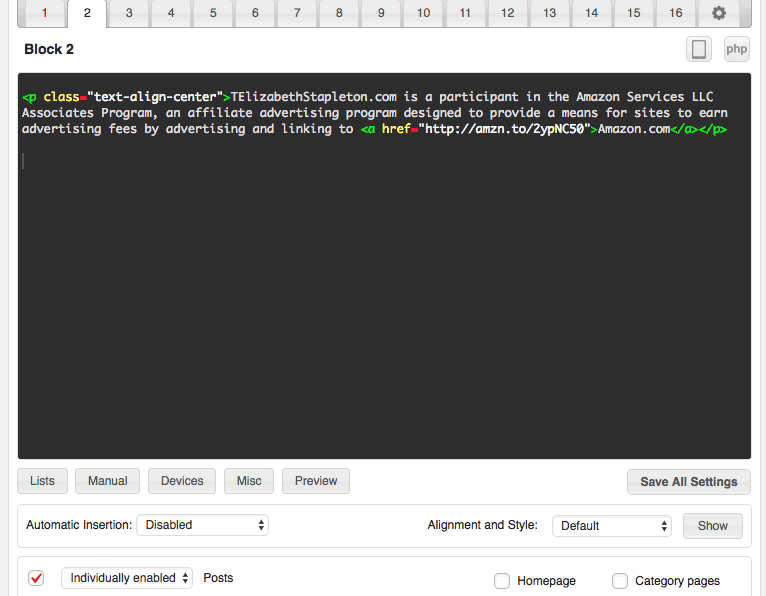 One way to accomplish this is to use the plugin, Ad Inserter. 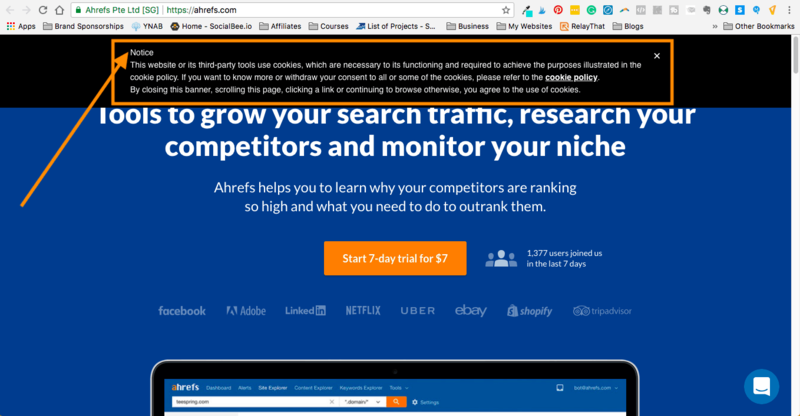 Yes, you can use it to manage your ads on your site but you can also use it to make sure your disclosure shows at the top of every post.What you do is you type in the disclosure including the link to your disclosure page and then you set the display rules. 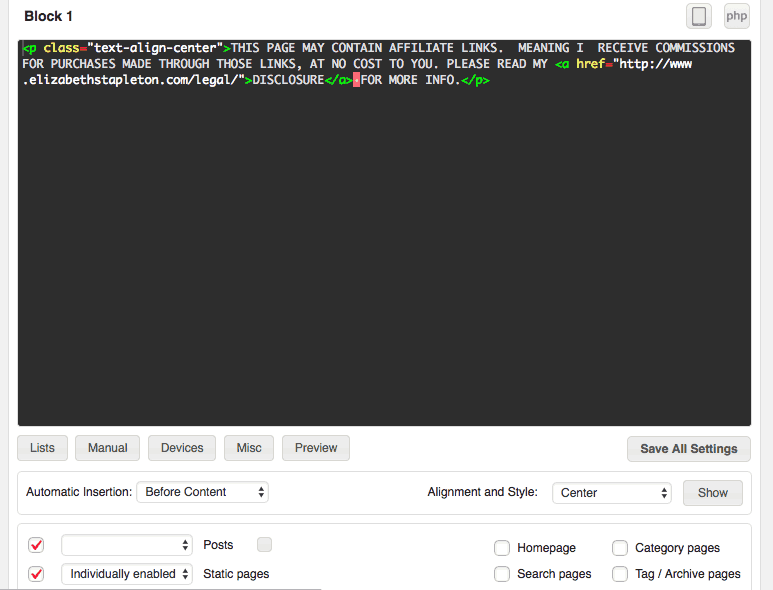 The block I use to display my use of affiliate links. However, since I don’t always have Amazon links on every page or post, I only show it when I enable it for the specific post. Because another very important aspects of your disclosure is that you’re not hiding it. It has to be above any links. You must see that disclosure before you see anything that is going to make you money. If you’re hiding it, by, for example, putting at the bottom of the post after the links then you’re violating the law. You also don’t want to put it in your sidebar because typically on mobile the sidebar content is below your post content and therefore doesn't’ satisfy the requirements. So we’ve covered why and where to place disclosures, now let’s dig into what language and information you need to include. Disclosures must be clear and conspicuous. Which means above the fold and easy to see and read. They must also use plain language. The FTC has specifically said that the language, “affiliate marketing” might not be understood by your intended audience. You need to spell it out. Be open and honest about your marketing and affiliate relationships.Think of it his way, if it wouldn’t be easily understood by your Grandma or a young child, it probably wouldn’t pass the standard required by the FTC. Being clear and concise is the perfect way to use "legal jargon"
THIS PAGE MAY CONTAIN AFFILIATE LINKS. MEANING I RECEIVE COMMISSIONS FOR PURCHASES MADE THROUGH THOSE LINKS, AT NO COST TO YOU. PLEASE READ MY DISCLOSURE FOR MORE INFO. The exact language you should use is going to vary depending on your profession, I recommend checking any sort of membership or licensing agency of your profession for guidance. For example, if you use Google Analytics, you are collecting anonymous information. This information includes where the user is from as well as demographic information such as their age and gender. If you collect email addresses through forms, you need to say you are collecting the personal information (name and email address) that they submit on the form in your site. As well as the purpose of that information. Remember disclosures are all about being upfront and honest with your audience, so any information that is being collected and used must be disclosed. When you do affiliate marketing or are just sharing links to other websites you need to ensure your users know that you are not responsible for the content of those other sites. Additionally, you need to let your readers know that those sites will likely have their own privacy policies that the reader should take note of. If you write on a topic of which you are not a licensed professional you need to say so. For example, on my personal finance website, as I am not a financial advisor, I share in my disclaimer that the site is for informational and entertainment purposes only. That I am sharing my personal experience which may not be applicable to others. If you write on a topic for which you are a professional, you will likely want to include a disclaimer that you are not writing in the capacity of your profession. For example, on this site, I include a disclaimer about being an attorney, but that I am not your attorney and the content provided is for informational purposes only and does not constitute legal advice. Depending on how your website is run, you may also want to include some terms and conditions for your site. In fact the Terms & Conditions maybe it’s own separate page on your website. Terms and Conditions typically address appropriate user behavior and perhaps any refund policy you have in regards to the products or services you sell. 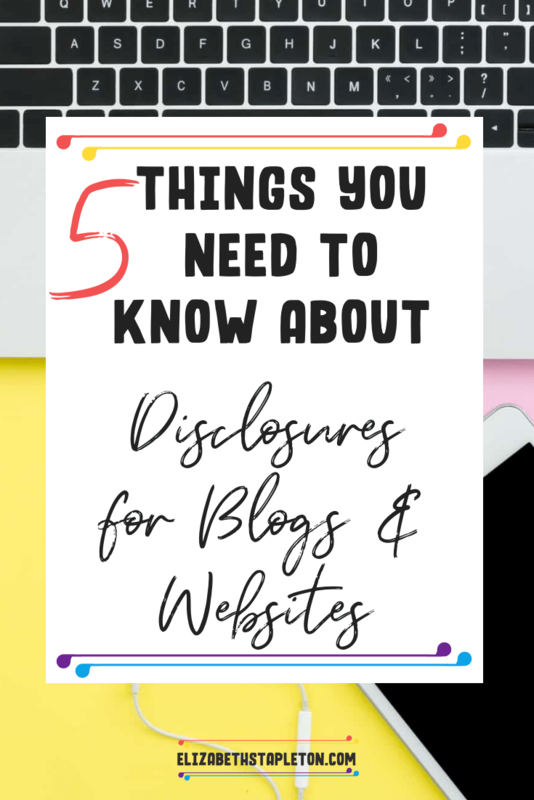 To ensure your blog or website is on the right side of the law, being upfront and honest through disclosures is more than a good idea, it’s an absolute necessity. You don’t want to lose the money you earned, simply because you forgot to include a disclosure in your post. Fortunately, technology makes it easy to ensure you are sharing the proper disclosures when necessary. 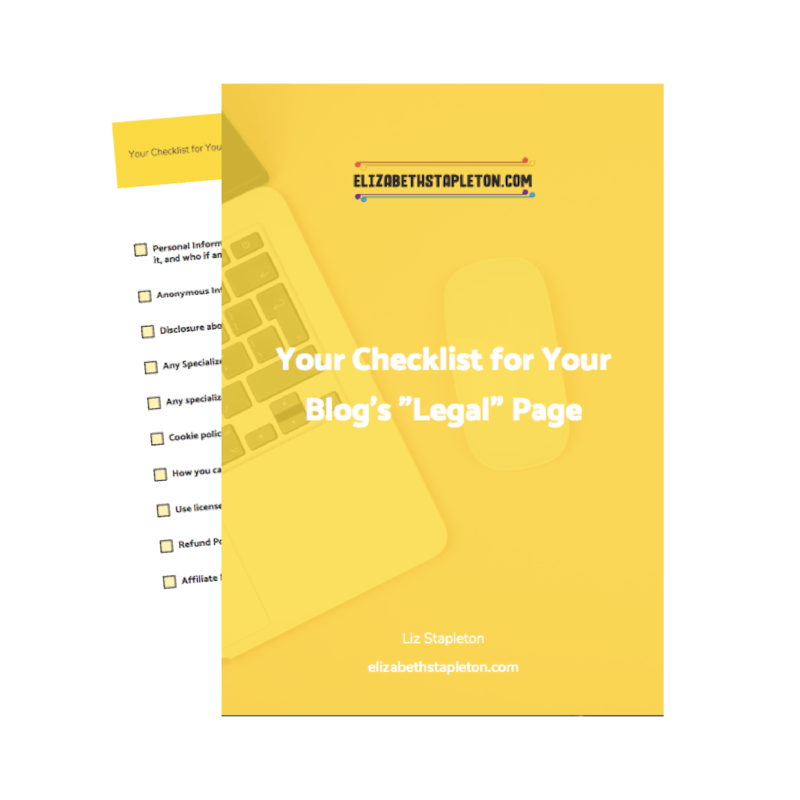 To help those in my community, I’ve created a checklist of what should be included on a blog's legal page. You can join my community and get access freebies like this checklist by subscribing below. Or you can buy the Website Legal Templates I’ve created. Was this post helpful? Be sure to pin it on Pinterest!